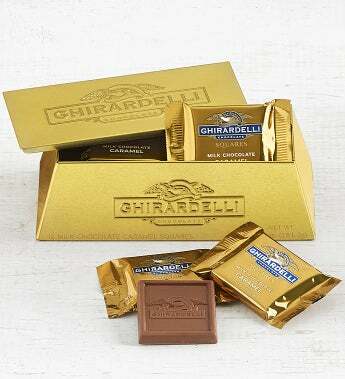 The taste of Ghirardelli is as good as gold - and now here's the perfect gift: a metal keepsake box shaped like a gold bullion bar and filled with Ghirardelli® Milk Chocolate Caramel Squares®. A perfect way to keep a secret chocolate stash at home or at the office! Ghirardelli is an iconic American chocolate company that was started in San Francisco in 1852 by an Italian immigrant. Their flagship store is still located on the San Francisco Bay waterfront where their original factory stood. Ghirardelli is now known worldwide for their decadent chocolate squares.